The M200MKII active speaker system is Swans’ classic Hi-end multimedia loudspeaker and an international performance, value, and popularity leader. When we say you can hear the difference, we mean it. The M200MKII active speaker system is Swans’ classic Hi-end multimedia loudspeaker and an international performance, value, and popularity leader. It’s been almost a decade since Swans first realized the full potential of computer sound with the classic M200. 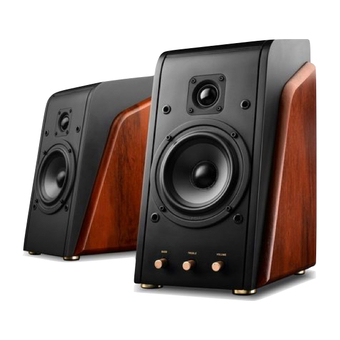 Originally designed as a compact active monitor, the M200 has gone on to became one of the most noteworthy Hi-end multimedia speakers in the world. M200MKII is the new generation of classic M200. Swans endowed the M200MKII Professional Multimedia Monitor System with the same premium acoustic design as we did our best Hi-end speakers and added powerful internal amplifier, HiVi poly propylene mid-bass driver, and a 1” soft fabric dome tweeter. Wood side panels lend style, substance and balance, and the stylish removable black knit grille offers great looks as well. The M200MKII is a speaker perfectly suited for iPhone music system, the desktop gamer or video / audiophile who wants fantastic, full-frequency sound at a great value. Audition the M200MKII Professional Multimedia Monitor System and hear that everyone’s talking about.